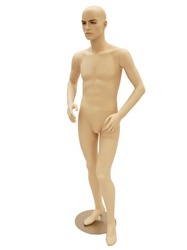 Caucasian Male Mannequin 5'9" tall perfect for WWII Military Collectors and Museums looking for the right size male mannequin to display Civil War, WWI or WWII era uniforms. Realistic hand painted facial features with a light "5 o'clock shadow" in an angled right pose. Flesh color tone made of fiberglass with plastic hands that rotate. Fingers moderately bendable by immersion in hot water. Articulated shoulders allowing the arm to slightly swing. Arms, Torso and feet removable for easy dressing. Glass base that includes two fastening systems (under the foot or on the back of the calf). Available optional back rod support if you need to support the upper body due to additional weight of helmets, backpacks, etc.